NASA research indicates hunks of frozen carbon dioxide - dry ice - may glide down some Martian sand dunes on cushions of gas similar to miniature hovercraft, plowing furrows as they go. "I have always dreamed of going to Mars," said Serina Diniega, a planetary scientist at NASA's Jet Propulsion Laboratory in Pasadena, Calif., and lead author of a report published online by the journal Icarus. "Now I dream of snowboarding down a Martian sand dune on a block of dry ice." 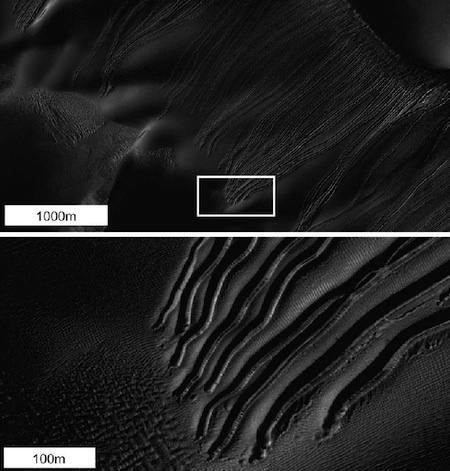 Researchers deduced this process could explain one enigmatic class of gullies seen on Martian sand dunes by examining images from NASA's Mars Reconnaissance Orbiter (MRO) and performing experiments on sand dunes in Utah and California. The hillside grooves on Mars, called linear gullies, show relatively constant width -- up to a few yards, or meters, across -- with raised banks or levees along the sides. Unlike gullies caused by water flows on Earth and possibly on Mars, they do not have aprons of debris at the downhill end of the gully. Instead, many have pits at the downhill end. "In debris flows, you have water carrying sediment downhill, and the material eroded from the top is carried to the bottom and deposited as a fan-shaped apron," said Diniega. "In the linear gullies, you're not transporting material. You're carving out a groove, pushing material to the sides." MacIntyre bent down without a word and picked up the wide skis necessary to negotiate the powdery ash. Charlie followed his example. Then they swung the spare air bottles over their shoulders, and passed out through the lock.